It's time again for Photo Art Friday!! Another opportunity to 'hang' your photo art in our virtual gallery and commiserate with like-minded photographers and artists! It's a real privilege to host this showcase for creatives around the globe. Aren't we lucky and privileged to be able to interpret the beauty of life and planet Earth with our photographs and digital editing?!! Such a joy!!! This week we have the option of linking up any piece of photo art that tickles our fancy, OR linking a piece of photo art that features a horizon. Easy peasy! I chose the latter. This image has two applications of my texture "Painterly" - blended in Hard Light at different opacities. A Layer Mask was used to remove some of the texture from the water to restore a bit of its smooth appearance and to remove tint of mauve from the cement in the bottom right corner. A Filter from my one month trial version of Photoshop CS6 Extended, called "Oil Paint" was then applied and its opacity reduced to 60%. I'm really happy with the result. This image received basically the same editing treatment as the previous image with only one application of pdpa Painterly texture, and with minor differences in adjustments of sliders. This image is looking south on the Richelieu River which drains from Lake Champlain into the St. Lawrence River on its way to the Atlantic Ocean. 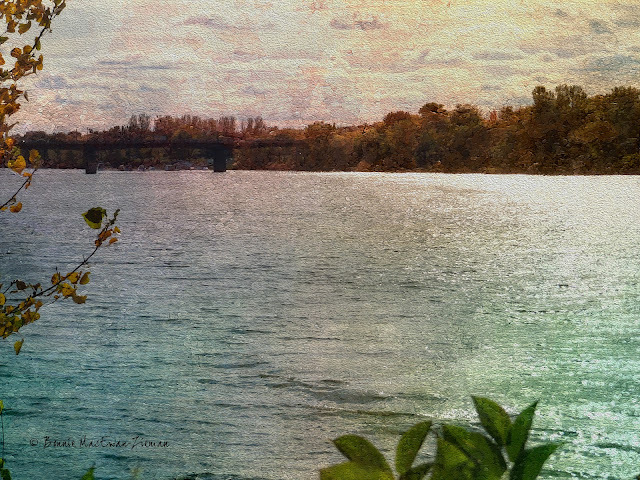 The previous image is a shot looking north on the Richelieu River. I pass by this section of the river all the time - living only two blocks away. The babbling brook that runs through our property drains from a mountain spring into this beautiful river. * a piece of photo art that features (in a strongly evident way) angles, lines or graphic elements. I really atmosphere you've created with the textures in the first one. Great job! I love your Painterly texture. You have used it with wonderful effect here. beautiful horizons bonnie! i am happy that i remembered to participate this week!! Your images are absolutely lovely - they definitely look painterly! I love this texture - it adds so much to already gorgeous photographs. The first one is my favorite - gorgeous! Bonnie i reallly love what you have done with this painterly texture, and it is great applied. I have it in its own special little spot so I can find it really easy. This is lovely on your photo though!!! Oh, these are just gorgeous!! Beautiful scenes and wonderful effect. I showed a backyard horizon and my bottle tree!! Like beautiful paintings! Good job! sorry i linked up for next weeks topic and than after for this week, when i saw others entries :) your horizon is wonderful! ooooohhhh - your photos are really lovely. I feel like they actually stopped me in my tracks to admire them. I like the painterly effect. Thank you for hosting another Friday for us to share our work with each other! Oh my Bonnie, this is probably one of my very favorites - stunning!! I really had fun with mine this week using some of your textures! I'm so glad I found this link up as you have opened my eyes to a whole new "art", thank you! What is the problems on your website? I can't add my work of art? But your piece of art is gorgeous. Nice horizone. I commented at about the time that the link up gadget disappeared from everyone's blogs so maybe my comment got lost too to I'll try again, and hopefully it's not a duplicate! ; ) Your photo art this week is one of my very favorites Bonnie, and I had so much fun with mine this week because I was able to use two of your textures that I won, thanks again! And you have opened my eyes to a completely different kind of photo art! Oh these are delightful. That first one is so dreamy and romantic. Bonnie, your photos are so moving! Excellent treatments! Can't decide which I like best. They are both so interesting and unique. Interesting how so many of us chose darker, moody looking images this week. Thanks for being such a great host!! 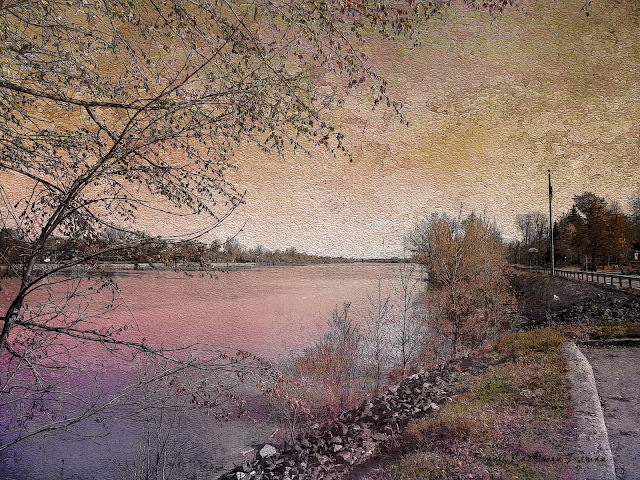 Beautiful frames, I love those river views, stunning textures and colors!. Happy weekend. As always,- you are doing magic, Bonnie! The first one is just wonderful! I have already been sitting looked at it, and its beautiful textures! Färgerna i texturen är perfekt till bilden. Tack för din fina kommentar. Ha de gott i helgen. I love the first one too. Thanks for your wonderful inspiration Bonnie. beautiful 'works of art' Bonnie! Beautiful work Bonnie! I love your captures and textures. Thanks for sharing your textures with us.